Never heard of doggie fosters? Don't understand the role that they play in saving so many of the dogs in the rescue system each year? Not sure if you know if you have what it takes to be a foster parent to a dog in need? SP: Fosters seem to be one of the most important parts of any successful rescue group. Where do you find your foster parents? AP: We have a very devoted foster coordinator who is recruiting constantly. With ads on Craig’s List, FaceBook, and word of mouth she has been able to double the amount of dogs we have been able help over the last two years. We also have partnered with Furry Fosters, a new group of young energetic people who know that foster homes are an important part of savings more animals. SP: What makes for good dog foster parents that represent your rescue? AP: People who care for these dogs along with their own, don’t mind if they have an accident, don’t expect perfection and are able to bring these dogs out of their shells. They are also people who know that having the dog be visible to the public at events is an important part of the rescue. They drive them to the events, they sit and talk with potential adopters and people just curious about what is happening. They help make a good impression to the public and are maintaining our reputation of a good, honest rescue here in San Diego. SP:Are there any restrictions or checks that you do to make sure that you have the right people? 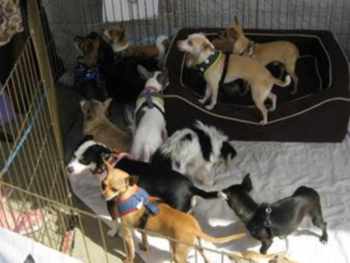 AP:We try to fit the dog to the foster home. A dog that has separation problems will not be put with someone that works long hours. We talk to them about the dogs, having them realize that they have been through a lot already and don’t want them in a position that might not work. People that rent need approval from Landlords and we do home checks to make sure they know what a tiny hole in the fence a dog could get through or how quickly they can run out an open door. SP: How does your rescue work with the foster parents? How much communication and support do you provide one another? Any other observations about the process? AP: We try very hard to answer any questions they have. Someone is always available by phone or email. We have provided the vet clinics where we have accounts in case of emergencies, we provide dog food and flea medication if they feel that expense is too much although most fosters are willing to contribute these types of items. We are working on a procedural manual since we are now growing and are dealing with more volunteers. SP: If someone has never been a dog foster parent, why should they consider it? Are there any steps they should take to prepare themselves? AP: Being a doggie foster is very rewarding for people that love dogs. You bring this scared little one to your home and show them love and feed them and keep them clean and see them blossom into a wonderful pet. If you are not planning on another permanent pet you need to tell yourself that you are going to help this one find a home and then another and another. First time fosters are the ones that become the “foster failures” in most cases. "Foster failures" being when a foster parent ends up adopting their foster dog. 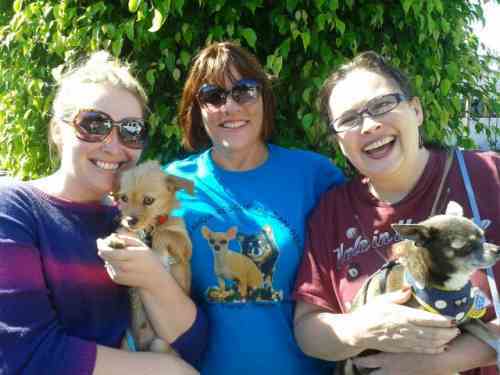 SP: Tell us about yourself and how you got started with the Chihuahua Rescue of San Diego. AP: I am a South Dakota farm girl, and I have always loved animals of all kinds. My father will tell you I was bringing home stray dogs since I could walk. My children, husband and I have worked with dogs for the CCI program which is a wonderful program. We saw a need for rescue volunteers with smaller organizations and in 1992 we got our first foster dog. 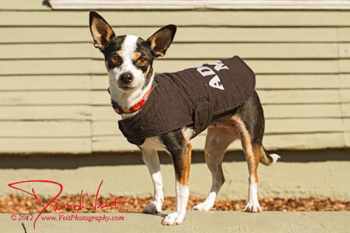 Since 2003 when we founded Chihuahua Rescue of San Diego we have been mainly working with the Chihuahua breed but other small dogs that need help are welcome. My four daughters have grown up with respect for animals and have been a great help with my passion. SP: Thank you so much. I think even after talking with many dog foster parents, that you've given me a lot to think about. Is there anything else that you'd like to share? AP: We have been getting many requests from families -- when the dog owner passes they have no place or don’t want the dog(s). We need to educate people that they need to make arrangements for their beloved pet rather than just hope someone takes care of it. Either state in your will who has agreed to take your pet and always leave some funds for the care of the animal. We spend a large amount of our funds on medical needs of dogs that come in needing dentals or even spays and neuters. If there is no record of shots the dogs have to be given them again and on some of these smaller dogs this can sometimes be very unhealthy. We are funded through donations and adoption fees and are all volunteer so when a dog comes in that needs $500 worth of medical and our adoption fee is only $200 we end up not being able to help as many dogs. I would also like to be able to go into the elementary schools to start educating the younger children on how to care for pets and make them more aware of the problem and hopefully share with their parents. I would like to see a better spay/neuter program in California. It was determined that it actually costs more to euthanize an animal than to alter it. If we could find a way to provide no cost to the public we may not be looking at the amount of puppies born that add to the problem of overpopulation in the shelters and rescues. There is a low cost program but many people don’t take advantage of it or find that there may be more costs suggested depending on the clinic. This plays on an owners emotions and thus makes the low cost much more expensive. When people bring in beautiful 8 week old puppies to a shelter to be euthanized because they have no buyers it tells me there is a BIG problem. I'd like to thank Ann (center in the picture below) for taking the time to educate and inform us on fostering, being a responsible dog parent, and how making a difference one small dog at a time can make a world of difference to the world. Note: * Yes, I know I say that a lot, but this interview made me nod and smile all the way through.